Quilting Adventures: Another Fat Quarter one....! I finished this little quilt from the Fat Quarter Quilting book by Lori Smith. This project is from the hand applique class that I am presently teaching at Fibre Junction. It's called Vase of Flowers. Not sure what I will be calling it! Any suggestions? I do like how it turned out! It is one of my favourites thus far! The designer called for 3/4 of an inch folded and I thought it would be much too small to be noticed, so I cut mine 1 (one) inch! 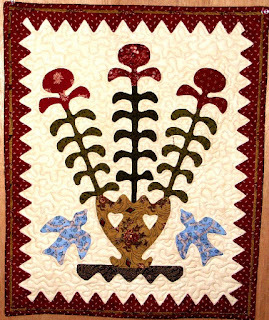 Beautiful piece, and love the quilting you did around it. I started a new small piece, but with the dark background I had to use wash away to do the lettering and won't know how it looks, till I wash it away. What a cute project! No suggestions with names...I had trouble picking for the kids! It looks really wonderful and I love the flat piping. 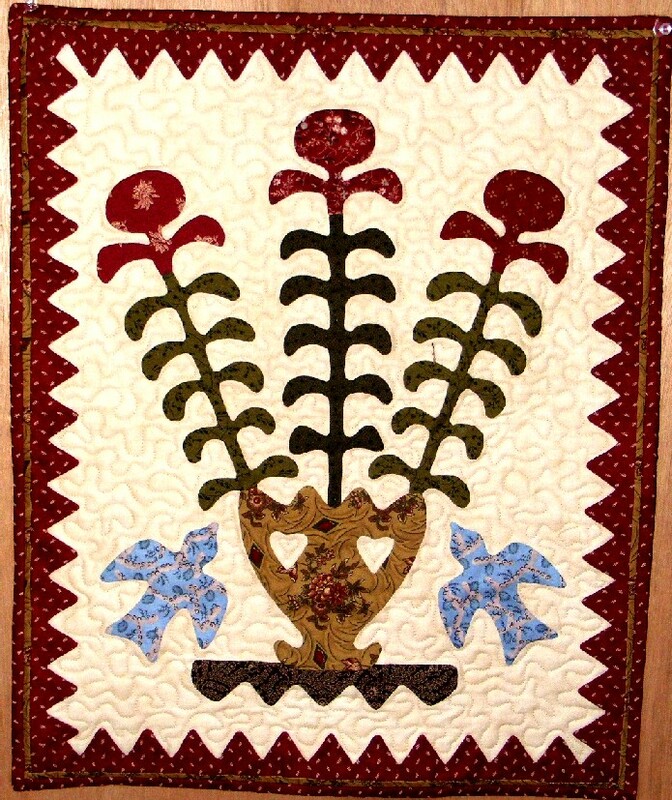 Beautiful applique quilt, I love the piping, I haven't tried that yet. Hi Carole - Your quilt turned out lovely! I loved this design so much when I got her book, that I did this same pattern - but as a hooked rug! Very fun! Very cute -- it looks like the perfect project for teaching applique! Bluebird's Choice would be my name. I just love bluebirds and they caught my eye when I saw this one. Nice job. Carole - I linked to your blog post the other day and shared pictures of my hooked rug and your quilt. So fun! I like how your vase of flowers turned out too!